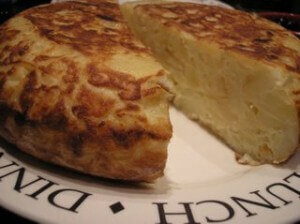 Historia: Tortilla española is a dish made with eggs and potatoes. The name comes from its form, like a cake or tortilla. There are many variations but this recipe above is based on the classic Spanish recipe. The potato has its origins in South America and was spread about the world beginning with the Spanish Conquest. It is documented in 1519 as a food known around Europe. Legend says that Spanish General Tomás de Zumalacárregui invented the tortilla as a quick, simple and nutritious meal during an era of war in Spain. Another versión of the legend says that it was invented by an anonymous housewife. Zumalacárregui passed by her house during the war, and since she was poor and only had eggs, onions and potatoes, she just made those into the first tortilla. The general liked it very much, named it the “tortilla” and helped it become popular. Wash, peel and cut the potatoes in very thin slices. Cut the onion and garlic in small pieces. Saute the onion and the garlic first for 5 minutes. Then add the potatoes with enough oil so that they won’t stick. Saute until the potatoes are translucent or clear-ish. Separately, beat the eggs together with the leafy greens and a little salt. Aparte, se baten los huevos junto con las hojas verdes y un poco de sal. Quickly add the potatoes to the eggs, mixing well. Have the frying pan ready on low heat with two large spoonfuls of olive oil. Quickly place the egg/potato mixture in the pan. Cook on médium low heat on one side until the tortilla is firm enough to flip. Flip the tortilla with the help of a plate and ease it back into the pan so that you can cook it on the other side. Getting it fully cooked in the middle requires a bit of time and patience! Soon enough you’ll have your Spanish Tortilla! It can be eaten hot, cold, in small pieces or even in a sandwich.